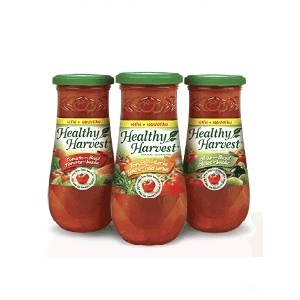 Healthy Harvest Pasta Sauce coupon is a mailed coupon. You can find this coupon on Websaver’s website. Visit Websaver.ca, select the coupon, create an account and request your coupons to be mailed to you. It will take about 2-3 weeks before you get the coupons and all the coupons are free. You can select other coupons while you’re there and they will all be delivered at the same time. This is a Healthy Harvest Coupon to save $1 on any Healthy Harvest Pasta Sauce. 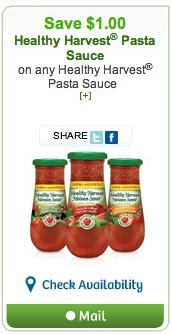 Healthy Harvest Pasta Sauce Coupon is valid only in Canada. You can find Healthy Harvest Pasta sauce in grocery stores and supermarkets. Healthy Harvest® Pasta Sauces are made with fresh, vine-ripened tomatoes that are harvested at the height of the warm summer months, then cooked and jarred within 48 hours to capture the freshest tomato taste. With chunky, flavourful ingredients you can see and taste, Healthy Harvest® Pasta Sauce raises the bar, offering fresh, quality flavours everyone will love.